Nations Press feature news VIRAL: Video of an Alleged Mom Hurting a Baby in a known Fast Food Chain, Goes Viral-Must Watch! 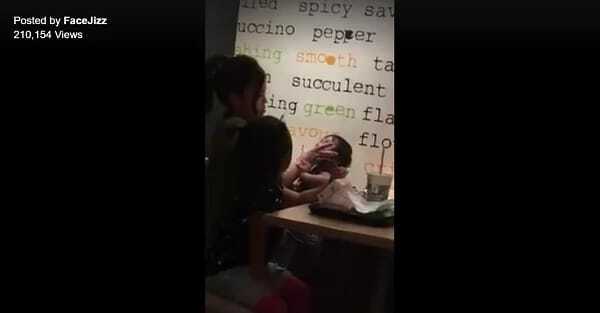 VIRAL: Video of an Alleged Mom Hurting a Baby in a known Fast Food Chain, Goes Viral-Must Watch! SPONSORED LINKS A viral video circulating in social media shows a woman abusing a baby in a fast food chain. The woman is with two kids – one is a toddler around three or four years old, while the other is still a baby. The baby started crying and caught the attention of the person who took the video. The video showed the woman getting pissed with the baby’s wailing. In anger, she slapped the baby then covered its mouth to prevent it from making a loud noise inside the establishment. Fellow customers, even the one who took the video, did not confront the woman. It is unknown if the lady is the mother of the children. Nevertheless, it is clear that the woman committed child abuse. Commenters gave their two cents on the video, the lady is young and may have not known the responsibilities of having children. Others are angered by the video and tagged DSWD to save the kids from their alleged abusive parent.